Leisure Liner 1 on a classic river cruise. The nicest thing about boats is that they whisk you into a different world - away from traffic, taxis, banks, politics and news. This is a world of freedom, sailing, fishing, barbecues, reading, photography or whatever. Trouble is, for most kind of boating adventures, it is a brief and limited experience because you need to return to port for some reason all too often, supplies, perhaps bad weather, or perhaps just because you are cold and miserable! 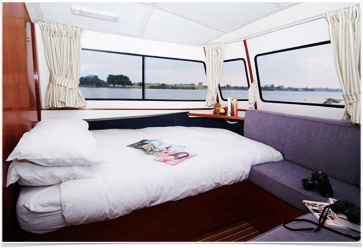 This is the beauty of a houseboat, settled in a nice inland waterway, there is no need to go anywhere - you really have everything with you! Pure bliss! 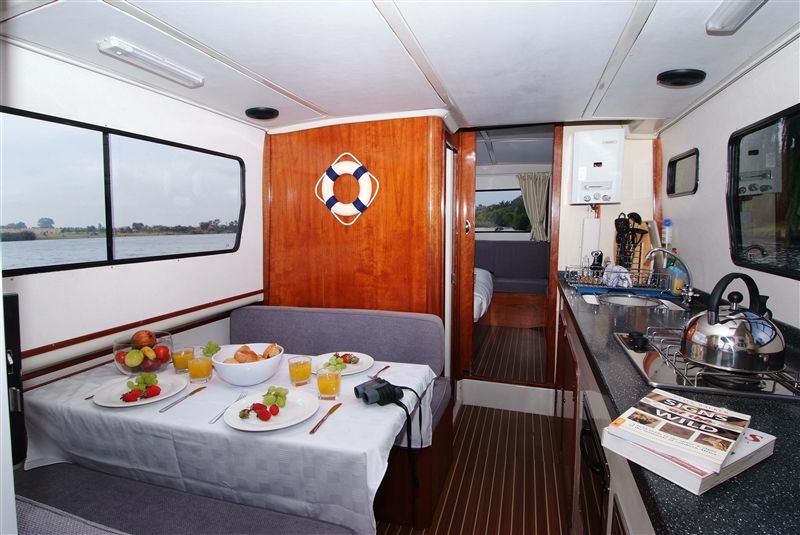 Spacious and simple, with nice covered aft deck. Over the past few years, I have had the privilege of three separate holidays or excursions on the Knysna Lagoon in a Leisure Liner Houseboat - being the original Leisure Liner series 1 operated by Lightleys. All three trips were very different but extremely enjoyable - due in no small measure to the design of this boat. I well remember arriving for the first trip in the middle of winter and with a fair bit of rain. We had booked for four nights and I first thought it would be a big mistake! It wasn't. Within an hour or so of arriving we had done the skippers briefing, loaded the boat, parked the car and we were underway. Easy-peasy - nothing complicated about it at all. With evening approaching we settled off Belvidere and laid anchor. Quite a decent anchor at that - this is quite important if you want to get any sleep! 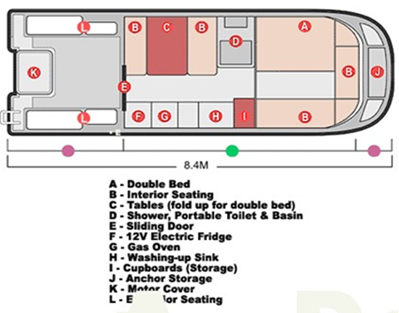 The cabin was really neatly laid out with all home comforts - a decent saloon, galley, heads and separate sleeping cabin up front. The sun had set by now so out came the red wine, the Weber braai, some music and soon we settled in for supper. Then a light rain started so we rigged the canvas bimini over the aft deck and just watched the lights on the shore and the odd fish jumping. The boat had very adequate lighting - including the navigation lights obviously - and it really was quite cozy. Eventually we moved into the saloon where out came some whisky, followed by my collection of cameras, ipads, laptops, GPSs, radios etc etc. We had a full 3G signal right across the bay which was a mixed blessing because I had some work to do as well. The rain picked up and we could see it bouncing off the water right next to us. Only 200m off the shore, but what bliss. I set the anchor watch on the GPS to a radius twice the length of the Anchor rode - being tidal one tends to spin around twice a night or so. The next three days were spent exploring the lagoon, braaing, and visiting the various restaurants such as Crabs Creek, the Waterfront, Thesen's Island etc. It was also a damn nice office for a while - very relaxing place to do the odd telecon, write a report etc. About the boat, at last! One of the nicest things about these craft is the size and placement of the windows. Strange to open with this but it has to be said. I am beginning to think this is one of the most important facets of practically any liveaboard boat these days - and one which could be largely improved in most cases. The Leisure Liner is fantastic in this respect. The saloon has great windows and so does the galley directly opposite. This makes it a great place to sit and survey the world should it be a bit cool outside. Even the cook and dishwasher can see the world which also helps! The sleeping cabin is superb with all round views - whether one has chosen to settle in and read a book in the afternoon sun, or see the sunrise, or simply to settle in during a day cruise in cold weather - as my ageing parents did on one day trip. Main sleeping cabin. What a view! Saloon and Galley. See the nice big windows. I haven't spoken with Angelo about this design as yet - I don't know what the design brief was at this stage. 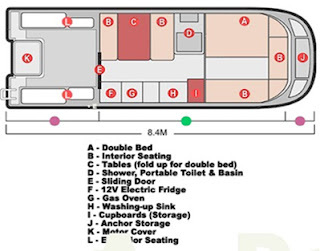 But I would guess it would have included aspects of safety, comfort, stability at anchor, manageable by an inexperienced couple, economical to operate and maintain, fit into a standard mooring, decent aft-deck, shallow draft, transportable on a trailer for maintenance etc, cope with reasonably adverse weather in the larger estuaries, and be reasonably mobile (for a houseboat). All of which it does pretty well.... Did I mention anti-claustrophobic? Well that too. A lot of this is made possible only because of the choice of hull - being a nicely shaped cathedral hull. Cathedral hulls have excellent form-stability, shallow draft, good load capacity, useful internal volume, and they move easily and efficiently. It is possible to keep the weight quite low and central. Certainly this boat felt like it had pretty good reserve stability - even in a large side-on chop. A very stable platform it is and I don't recall any rolling to speak of. Buoyancy in the bow is another useful aspect and this one is high and proud, coping easily in a severe chop. 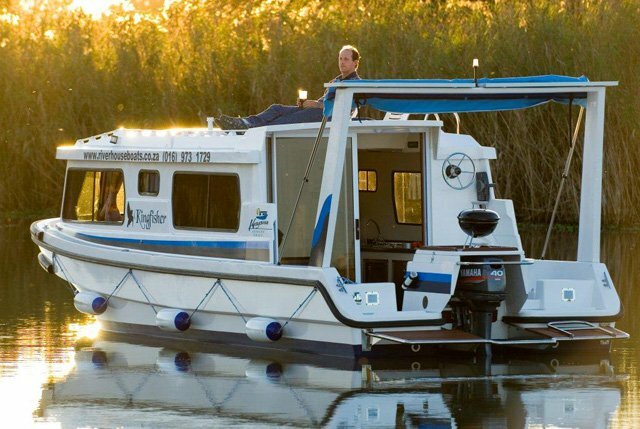 All this means you can load it up with a large cabin right to the ends, on a small footprint, and still have a mobile boat. Construction would be economical relative to the capacity. The cabin uses the full width of the boat, which gives it loads of internal volume and full standing headroom. To get to the bow (anchor) it is necessary to walk on the gunwales either side - but this is very easy due to the handrails on the coach roof. Once on the bow, there is a secure place to stand and handle the anchor. This design (Leisure Liner 1) was intended to have one engine, about 22 kw (about 30 Hp), which is quite adequate for rivers and estuaries. 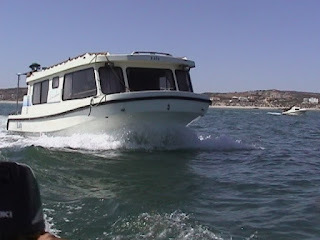 I could imagine wanting a wee bit more on the Langebaan Lagoon if facing a fresh South Easter, perhaps 40-50 Hp, but that wouldn't be needed anywhere else. The boats I used all had single 40 Hp 2-stroke Yamahas, which did remarkably well. In practice I ran them at about 30% throttle at about 4-5 knots. This gives a pleasant and quiet ride whilst not wasting fuel. Full throttle would bring up 6-7 knots depending on load and wind etc, and a far higher fuel bill. Not necessary at all. In this age a 4-stroke would be a nice choice though. 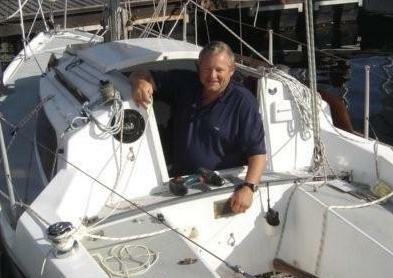 Personally I was quite happy with a single engine, having used outboards all my life without much trouble, even at sea. which can double as a lid for the small kettle-braai! Under way, it looks the business! Any criticisms? Of course it's easy to criticize a houseboat either as a boat or a house - it's actually quite a challenging design process! 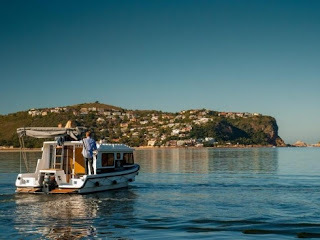 Manoeuvring a large flat bottomed boat like this with one engine in the tight confines of a marina is another aspect that takes a bit of getting used to, and in some cases the charter agents offer a pilot to come aboard for this. But tight marina berths are not the norm for many of these vessels and it won't usually be an issue. A bit of practice is all that's needed. One one occasion, I thought it would be neat to have an indoor steering position, although I can see how this could add unwanted cost and complexity. Overall - dam nice boat - cleverly conceived and designed - and loads of fun in my experience. 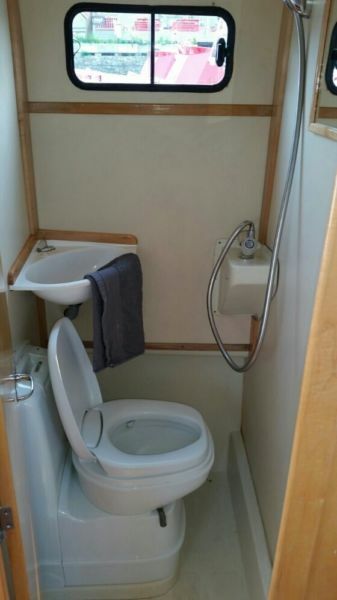 Described as a "LOW WASH GRP PRODUCTION HOUSEBOAT". Designed in 1988, 90 built! 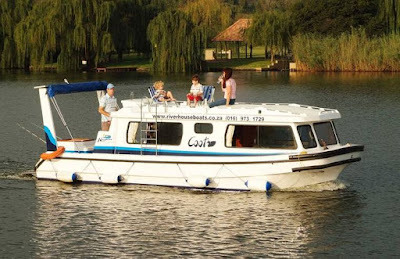 NOTE that the Leisure Liner 1 is no longer being built, and would require design changes today to comply with current SAMSA regulations. The Leisure Liner 2: In recent years, a newer update model of this design has been released - known as the Leisureliner 2 (LL2). Full details on their website at www.leisureliner.com. I have not experienced or even seen the new model personally, but the new design is a MAJOR UPGRADE from the LL1. 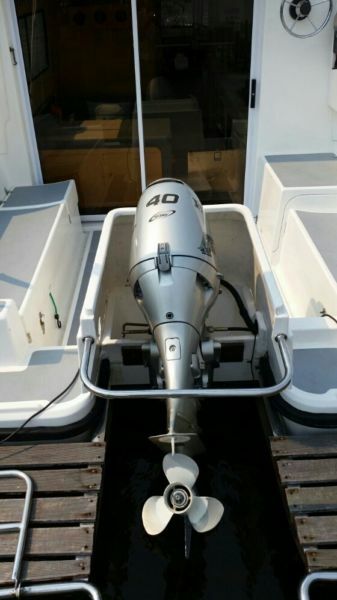 Two outboards, 40 - 90 Hp - easy cruise at 10-12 knots, maxes out at 20-25+ knots with 90 Hp! Coastal capability in light to moderate conditions! Furnishing as for a luxury yacht. Quite good value considering the package - this is a substantial vessel... pricing per the wesbite shows R 795k for the basic vessel, excl. VAT, motors, options (at Sept 2015).